Bob Mintzer has a habit of pulling his students into his professional performances. This is normal at USC Thornton, as Mintzer, USC Thornton’s Bowen H. “Buzz” and Barbara M. McCoy Endowed Chair in Jazz, and his fellow faculty in the Jazz Studies and Studio Guitar programs regularly call upon current students to perform in their professional ensembles. Earlier this month, Mintzer went bigger than just playing with a handful of students. 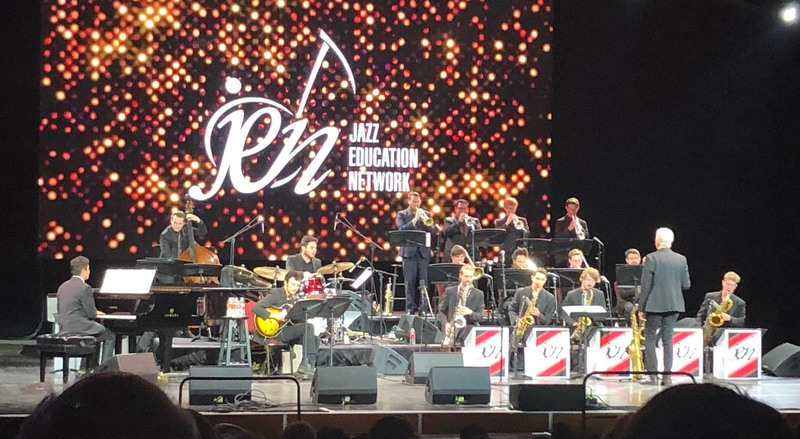 He called on the entire USC Thornton Jazz Orchestra (TJO) to close the 2019 Jazz Education Network (JEN) Conference on Sat., January 12 in Reno. 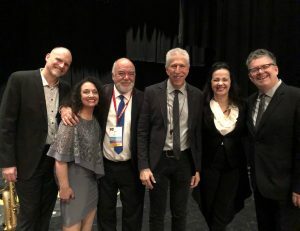 Bob Mintzer and Thornton faculty member, Peter Erksine (center), with the members of the NY Voices. Mintzer released a new album in June that featured his award-winning big band, the Bob Mintzer Big Band, in a collaboration with New York Voices, the internationally acclaimed jazz vocal group. The release, Meeting of Minds, focused on arrangements of jazz standards from the 1930s and 1940s. And when it came time to plan a concert to close the JEN Conference, Mintzer again collaborated with New York Voices in a performance that pulled tunes from the celebrated CD. Except this time, he asked the TJO to step in for his professional ensemble. The result? A standing ovation. The USC Thornton Jazz Orchestra performing at the JEN Conference.